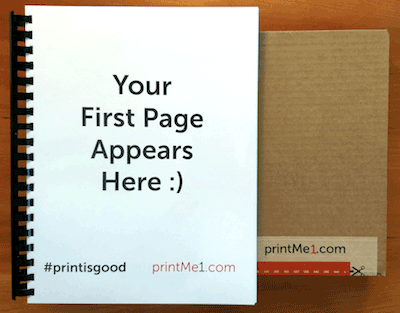 printMe1.com is a simple PDF printing service for high page count documents. No log-ins, no accounts or passwords are required. Upload your PDF (please make sure it's yours, or freely reprintable), choose a binding, checkout, and receive your print in the mail in about 1-2 weeks. We only ship to domestic US Addresses. Note: you can combine multiple PDF’s into a single print file to print by starting at our Build feature, and then checkout automatically from there with your modified PDF. Read more about the Build feature here. We can print in B&W or Color. There is a minimum charge of $11.99 for any order and includes either B&W pages or color pages. For additional prints over the minimum, B&W prints are 3.9¢ per page and color prints are 19¢ per page. Shipping is included in our pricing (Domestic US postal addresses only). Payments and checkout are handled through Paypal. You do not need a Paypal account, but it is recommended to have one. When shipped, your shipment will be trackable in your Paypal account along with the other transaction details. We do not retain any credit card information. Paypal helps us keep our process simple and secure. We ship to your address in your Paypal account via the US Postal Service. Please allow 1 to 2 weeks to receive your document, depending on your location. Most orders with our standard shipping are received in about a week from the date the order is placed.